Paul Wilson: Royal Connaught architect says "it's got to be full bore." Towers – three tall ones– will rise beside the Royal Connaught. The condo team says the project has to be big to work. Plus, a few exclusive photos from several decades ago. They didn’t have to be there, but the Royal Connaught team showed up the other day for the monthly meeting of the Hamilton Municipal Heritage Committee. "We’d rather see you not have any surprises," explained Wayne Harrison, representing KNY Architects. In fact, the committee was surprised. Because this proposal looks like it really will fly. Other schemes for the Connaught – five-star hotels, spires to the heavens, affordable housing – all collapsed in a sorry heap. And there the Connaught stood, empty for nearly a decade, a hulking symbol of how downtown had fallen. 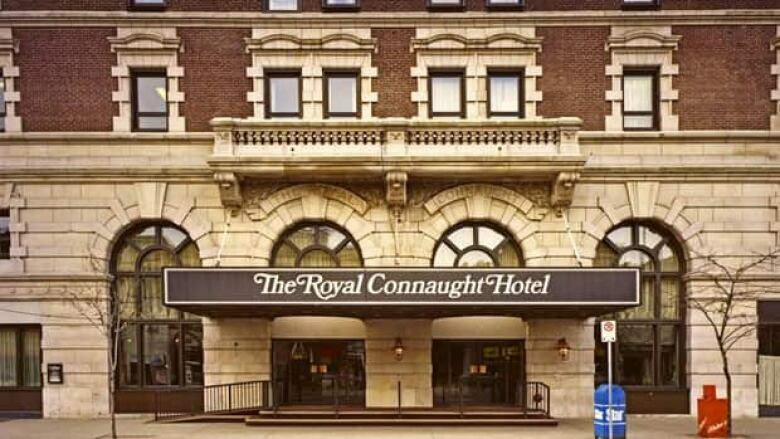 Last month came official word that two of the city’s largest developers – Rudi Spallacci and Ted Valeri – are going to turn the Connaught into condominiums. They have the resources, and it seems they also have the will. "We can’t go in there and do something minor. It has to be a definite statement for this to work. It’s got to be full bore." So there are to be three towers beside and behind the Connaught – 36 storeys, 33 storeys, 24 storeys. They will fill all but a corner of the block bounded by Main, King, John and Catharine. There are to be 708 units in all. There is still the possibility of a hotel component for the complex. But, as Harrison pointed out, "in Hamilton right now, residential is a reasonably easy sell." Parking was a major challenge in the design. There will be two levels underground and seven camouflaged levels above, accessed from Catharine Street. About 135 of the units will be in the old 12-storey Royal Connaught itself. Harrison assured the heritage committee that part of the project will be handled with great care. "We’re not touching the brick work, we’re not touching the limestone," he said. There are issues with ventilation to the outside. When Harry Frost put up his showpiece in 1916, he made sure there were up-to-date elevators, telephones, brass beds. But he wasn’t worrying about bathroom exhaust vents. "We don’t want to be banging those out through the bricks," Harrison said. "It would be a dog’s breakfast." He produced drawings to show how ventilation could be hidden in grille-work around new windows. Harrison described the rear of the Connaught as "pretty junky " and that’s no exaggeration. The plan is to knock down the three-storey extension on the west side of the Connaught’s backside, which contains the old ballroom. Then a wall of glass will rise right across the Connaught’s south wall, bringing light to the complex. Then there’s that exotic space on top of the Connaught, the old Starlight Room. It seems to be missing from the condo rendering, but Harrison says it’s part of the plan – one way or another. "It’s so beautiful... it’s still under discussion." Just one part of the interior will be restored – the grand lobby still remembered by many. It will become the sales office. Sales done, it will be the entrance for those who live at the Residences of Royal Connaught. Harrison says that lobby doesn’t look like much today. "The building inside right now is pretty much just steel beams and concrete floors." "It was probably a one-day location shoot for me. I probably had a shot list, arrived at the hotel, found my contact person, went over the list and did the shoot according to the best light. I don't remember how the film was being used. It was probably a brochure to help advertise the hotel." All going well, the sales centre in the restored lobby will open by late summer. Then you can take some pictures of your own.